Spring has arrived, and we're on the edge of our seats waiting for the season's first blossoms to appear. If you're feeling the anticipation too, why not take matters into your own hands like our friend Morgan Levine has? 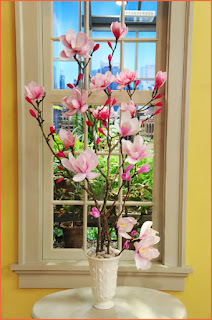 Morgan created these lovely magnolia blossoms from our florist crepe, demonstrating her project this week on Martha Stewart's television show and website. Judging from the response we've been getting, it seems everyone is ready to take a turn helping Lady Spring step out. Thank you, Morgan and Martha!